The early aughts belonged to the garage rock revival from New York City, yet by 2004 the scene began to show signs of exhaustion. The best acts had been gobbled up by major labels and Top 40 radio. In May of that year, a little-known group based in Brooklyn put out a sleeper hit titled Sung Tongs. The group, recently dubbed Animal Collective, and the album would soon shift the indie landscape from the dives of Manhattan to the basements of Brooklyn for the rest of the decade. The genre-bending “freak-folk” record paved a path for Brooklyn acts like Grizzly Bear, tUnE-yArDs, The Antlers, Dirty Projectors, Yeasayer, and Vampire Weekend. Animal Collective is comprised of four members: Avey Tare, Panda Bear, Deakin, and Geologist. Since their inception, the band has operated in combinations of two to four members. Avey Tare and Panda Bear recorded and performed the songs that make up Sung Tongs. In December of 2017, the twosome performed the album in full for the first time at Pitchfork’s 21st Anniversary Show. Less than a year later, the one-off show has morphed into a full-fledged summer tour. Lonnie Holley has been tapped as the opening act. At the tail end of Seattle’s recent heatwave, Holley was tasked with warming up an already sweltering crowd at The Moore. Holley played an experimental brand of blues with a healthy dose of psychedelia. He performed seated at a keyboard and is accompanied by a trombonist and percussionist. His stream of consciousness approach to lyrics and songwriting, not to mention his yalping voice, was grating at worst and hypnotic at best. Holley’s last song was a slow burner that climaxed with rolling drums and redeemed his long-winded set. Avey Tare and Panda Bear also performed seated with minimal gear between them at center stage, armed with acoustic guitars. They puzzled the crowd by opening the set with a little-known b-side called Tuvin. The song is presumably named after Tuvan throat singing (Mongolian throat singing), which the band emulates on the track. The Sung Tongs outtake has also been reworked and extended, almost doubling its original length. Slow songs like “The Softest Voice” and “Visiting Friends” invoked a feeling of longing, allowing audience members to plunge back into their first experiences with Sung Tongs. While the up-tempo poppy songs pushed the audience into a joyous present. “Kids on Holiday” was a clear high point. Avey Tare’s vocal yelps echoed through the room in accompaniment with a strobe light, and it was hard not to laugh. Animal Collective has never shied away from leaning into humor as a creative outlet. Sung Tongs has a child-like quality and it’s sillier moments are meant to be funny. Clocking in just under a minute, “College,” Sung Tongs’ shortest song, was one of the evening’s most memorable moments. Most of the track is the moaned vocals of both singers, and comes to an abrupt end with its only lyric: “You don’t have to go to college.” The crowd grew increasingly restless until the moment the lyrics came, which were then belted out in a cathartic unison by the entire room. The band went straight into the percussive blasts of “We Tigers,” enlivened by the burst of energy from the audience. The band made no acknowledgment of the crowd until the end of “Whaddit I Done,” when Avey Tare announced, “That was Sung Tongs.” and thanked everyone for coming out. Instead of ending the set there or doing an encore, Animal Collective treated the room to a few more deep cuts. 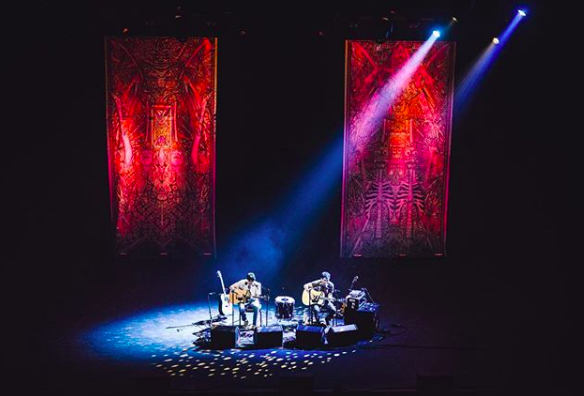 The post-Sung Tongs set began with the song “Prospect Hummer,” which was followed by a brand new song, “Sea of Light.” Blue lights spun around the band and projected out into the crowd, plunging the Moore Theatre underwater. A song from Animal Crack Box, the 2009 box set of live tracks and previously unreleased material made an appearance as well. The Sung Tongs-era b-sides complemented the setlist without over bloating it, and were appropriate for a band with an always mutating sound. As Animal Collective thanked the audience one last time, a fan in the front row asked Avey Tare for his drumstick. He delightfully obliged, and the band walked off stage waving goodbye. The Moore was muggy all night long and somehow that felt fitting; there’s something extra nostalgic about a summer evening.